Nairo Quintana (Movistar) won stage three of the Volta a Catalunya on Wednesday in an explosive finale at the ski resort of Vallter 2000 near Girona. Once again, Bradley Wiggins (Sky) rode aggressively to put pressure on his rivals. Quintana’s Movistar team-mate Valverde placed second at six seconds, with Joaquim Rodriguez (Katusha) in third and Wiggins in fourth at the same time. 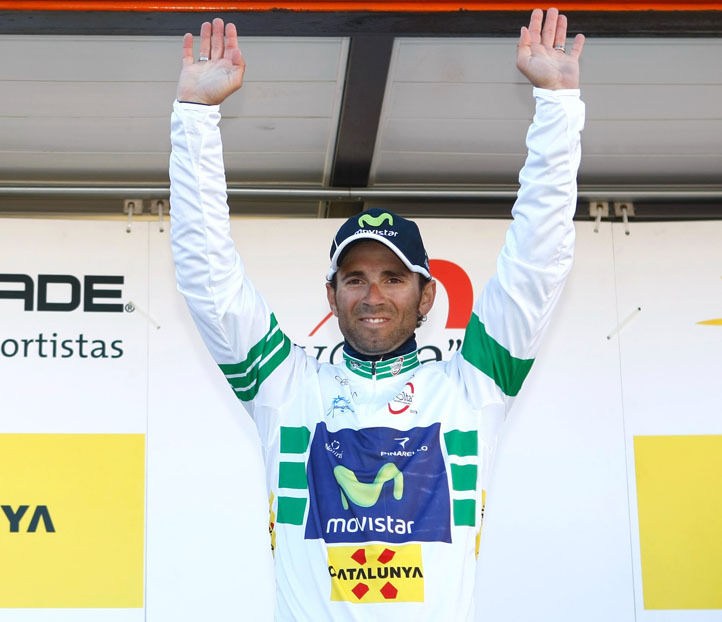 Valverde moved into the overall race lead, six seconds ahead of Rodriguez with Wiggins in third at 10 seconds. The day’s four-man break split into two groups with 40km to go, with Nicolas Edet (Cofidis) and Karol Domagalski (Caja Rural) ahead of Martin Kohler (BMC Racing) and Lucas Haedo (Cannondale). Edet dropped Domagalski on the final ascent to the ski resort of Vallter 2000 and managed to hang out until 4km to go, when Jurgen van den Broeck (Lotto-Belisol) leapt out of the peloton and then passed the Cofidis man. Van den Broeck couldn’t keep up the momentum and was caught by the Sky-led bunch with 2km to go when Tom Danielson (Garmin-Sharp) struck out on the winding road edged by thick snow. Danielson’s move was the catalyst for the main contenders to chase him down. 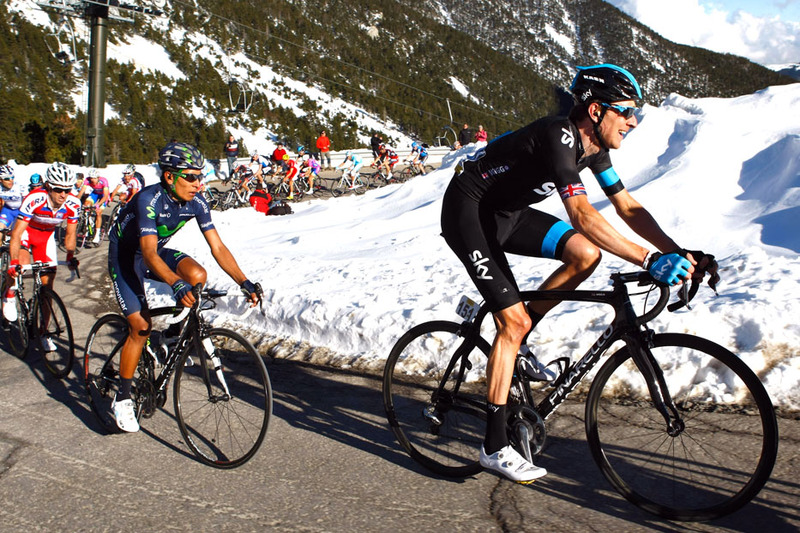 Wiggins was the next to attack inside the final kilometre, marked closely by Quintana. The Colombian sat tight on Wiggins’ wheel and then accelerated as Rodriguez simultaneously put in a move followed by Valverde. 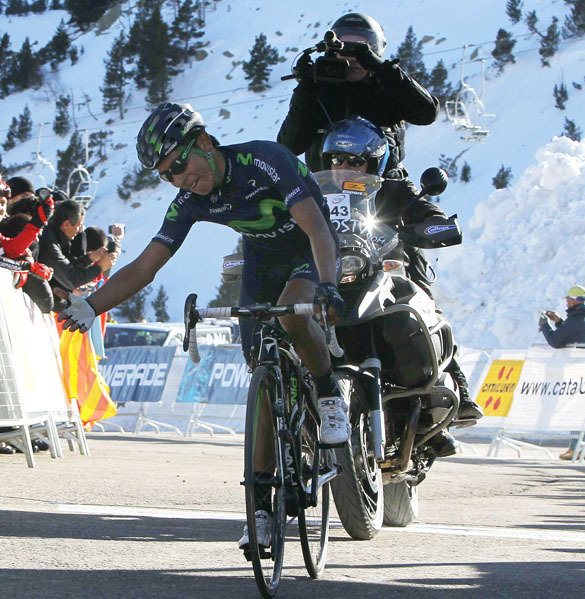 Rodriguez couldn’t match Quintana’s pace, and Valverde edged in for second to give Movistar a one-two. Wiggins came in fourth. The race stays in the mountains tomorrow for the toughest stage – a 218km trip that concludes with a climb up Port Aine Rialp, topping out at around 2000 metres above sea level. The race concludes on Sunday, March 24 in Barcelona.